Which class would you take? With beautiful blue skies and a touch of fall in the air, I strolled the streets of Berkeley pretending I was back in college. Well, actually I was pretending I was my husband back in college because Berkeley is his alma mater, not mine, but I still caught the nostalgia bug for my own days in college. And there is no place more quietly exciting than a campus bookstore in the fall. 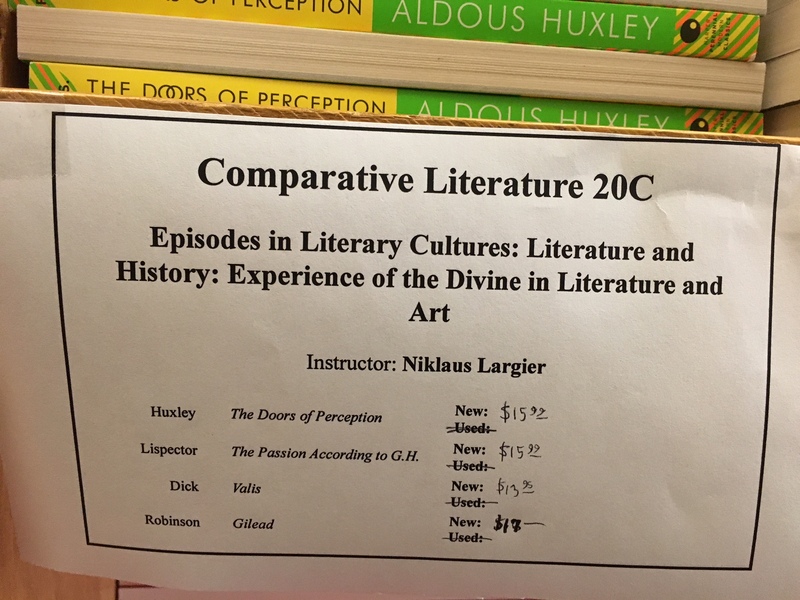 After I had exhausted all the regular bookstores in Berkeley I found myself in a few that sold course books. I thought fondly of how much I loved going course book shopping when I was in school. It was especially fun as an undergrad when there was so much that was new and so many courses outside my major to take. Not surprisingly then, I found myself wrapped up in a college fantasy as I strolled the aisles. But which classes would I take? Which class would you take? I’m glad the instructor dropped The Mill on the Floss in favor of Daniel Deronda since I’ve read the former but not the latter. But I wonder if I could actually get through Bleak House. Is that the one with Jarndyce and Jarndyce? But more than anything I’d be curious to see how it all fits in with Darwin. Or is it the other way around? 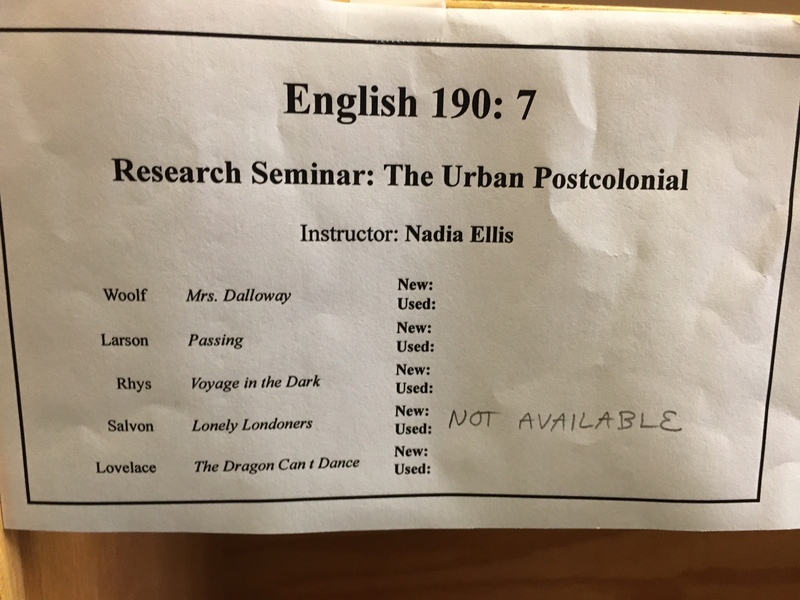 Although I find Mrs. Dalloway dull as dishwater, I loved Passing and am curious about the “not available” Lonely Londoners. Huge fan of Americanah, couldn’t get into Homegoing, but would probably be interesting to talk about in class. I think I would probably hate this class. A lot. Oh lord. 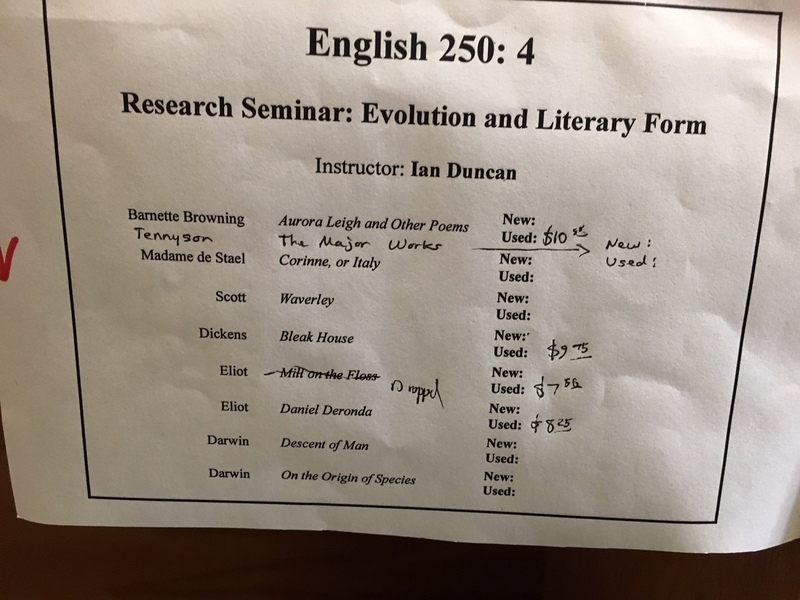 Maybe if I took this class and got to go in depth (and maybe got some help in understanding them) I would hate Faulkner and Conrad less; appreciate James and Woolf more, and finally get around to Beloved. Nabokov and Wilde would be re-reads, but then again, so would the James, Woolf, and Conrad. I would really have hated this as an undergrad. 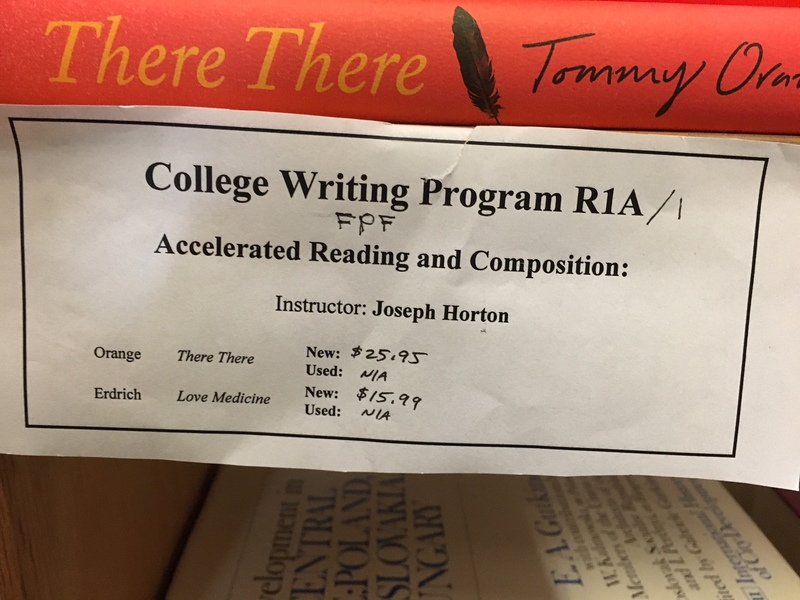 My writing classes in college were freshman comp and then writing for the social sciences. I have no idea how this class would work. This one looks a bit fascinating despite my general dislike of Robinson. With the exception of the text penciled in at the bottom, I’ve already read all of these. That would be the best of all worlds, re-reading 3 short books and then going in deep. 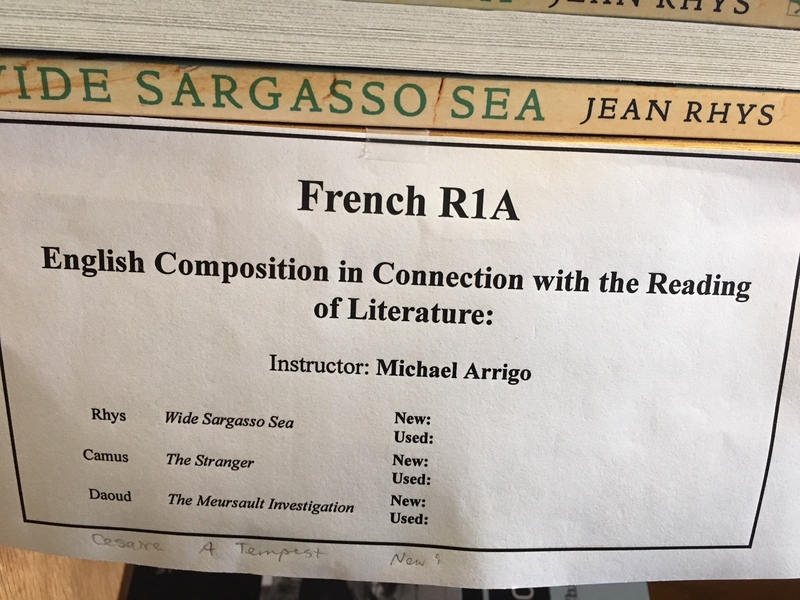 Despite my dislike of Conrad and my fear of Ulysses, this would probably be the class I would take. But then again, maybe not. Probably more interesting to go a little further outside my comfort zone. At least three courses had Fun Home as assigned reading. I did actually buy one of the required texts for an Italian class on English grammar for students of Italian. I worry that some Berkeley student doesn’t have his/her textbook because I bought a copy, but one of my challenges in studying a foreign language is my spotty knowledge of the technical names of parts of grammar like “direct object pronouns”. I would probably take the modern British lit — I thought The Return of the Soldier was brilliant. 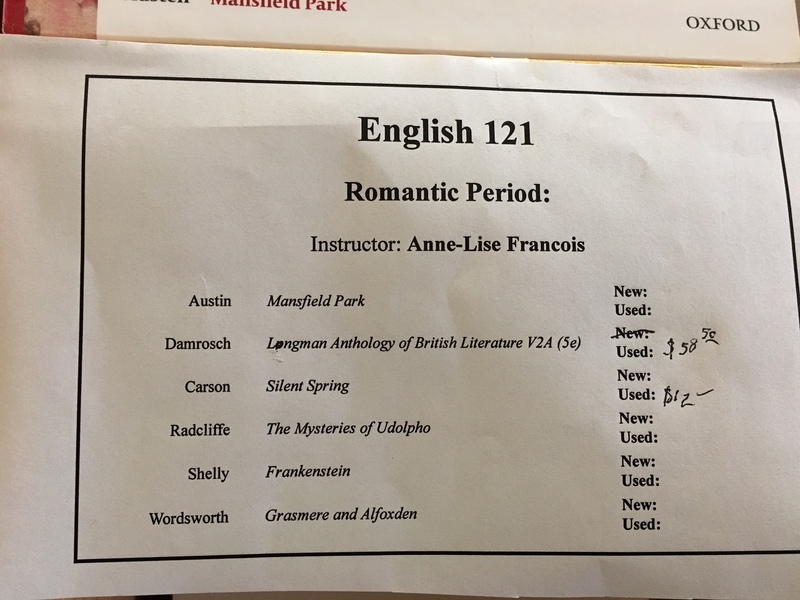 I actually did take Modern British lit my first semester of college, I remember we read Howards End and Wide Sargasso Sea (and we had to read Jane Eyre so we would understand WSS). I think we we also read Conrad, probably The Secret Sharer. Great class. I also noticed several other spelling errors, esp. The Prime of Miss Jean Brody. Harrumph. 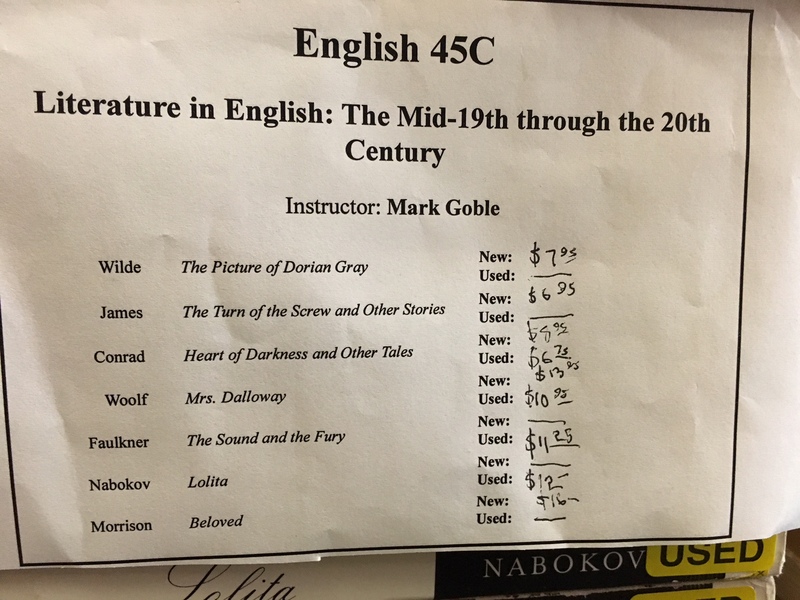 Would not want any class with Faulkner and Nabokov. Can I do them all, please????? I get warm and fuzzy feelings when I see class lists of texts. Such a perpetual student and why I buy books that list class lists, etc. Thanks for sharing this and good luck to the students in these classes. I can’t imagine reading Ulysses at that age. 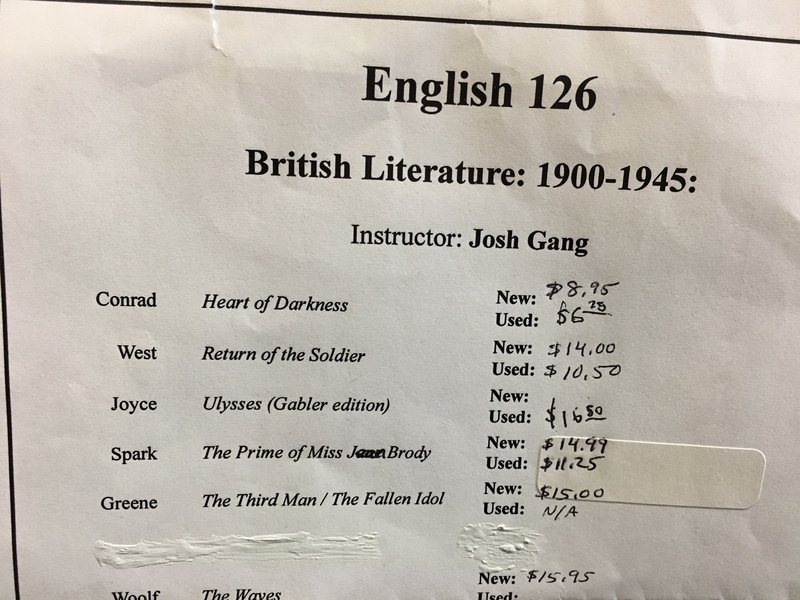 I can feel huge swathes of people recoiling at the idea of including IRISH James Joyce in a BRITISH literature course! I’m pretty shocked that they’ve done that (not to mention Polish Joseph Conrad). Also your ‘dull as dishwater’ intrigued me, as I’ve only heard ‘dull as ditchwater’ before. Is this a Br vs Ame thing?? I’m all for the cherry-picking approach, too… especially after my recent failure with Udolpho! I was in English major for undergrad and grad school, so I would be all over those classes :) I used to love picking my classes for the semester and then going to buy all of the books – talk about fun times. I meant an English major not in English major – LOL! OH this was big fun!! Would probably take the Brit course, cause ‘why not!’ Thank you for posting. Berkeley is a lovely campus and ohhhh the bookstores in town! Glad you got to enjoy. I liked Udolpho but having said that, I’ve not rushed to re-read it in the last 28 years …. I would pick the one on Literary borderlands. But auditing only. I wouldn’t want to have to write a paper. The idea still terrifies me. Those blue books where you had to write an impromptu essay? Not my strong suit. 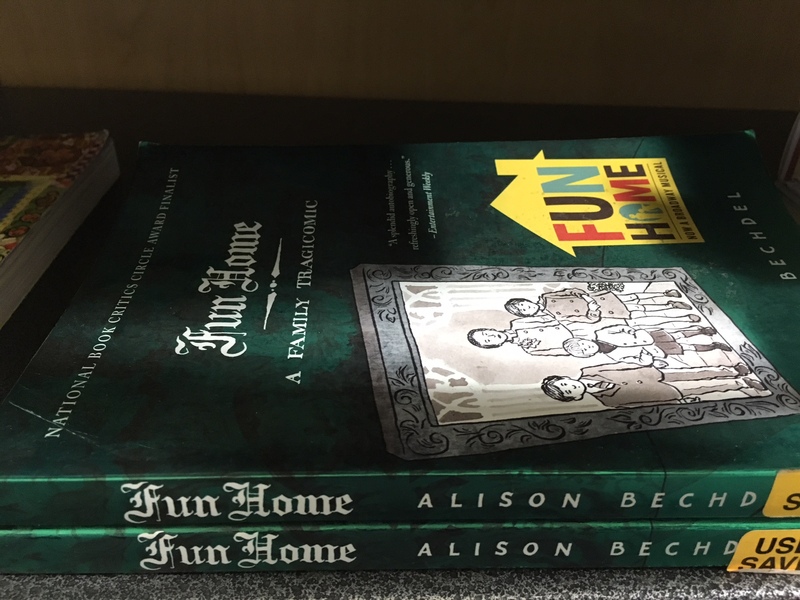 Bleak House is wonderful! You should give it a try! I also found The Mysteries of Udolpho a bit of a slog. I lived this dream! 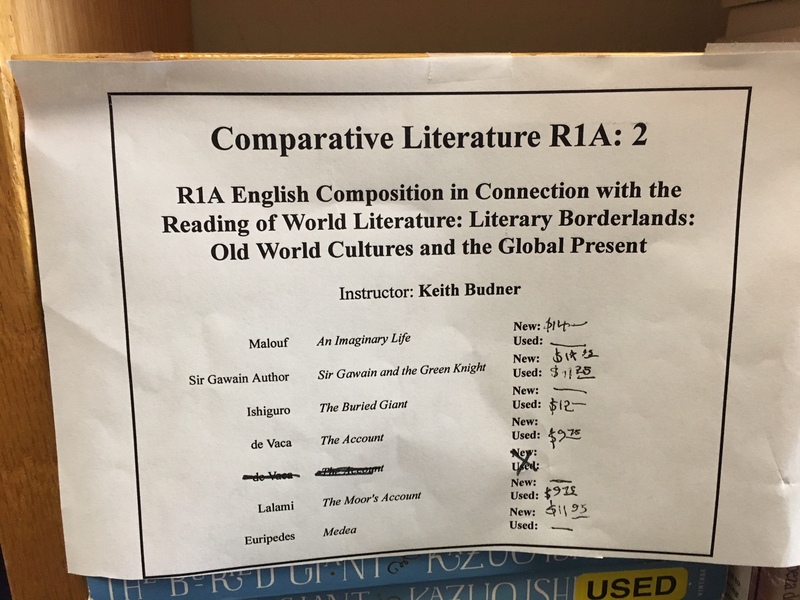 When I went to Princeton for a mid-career master’s degree in public policy at age 37, I went through the catalogue, picked my dream undergraduate course–medieval French literature–and ended up auditing it along with my regular schedule of microeconomics, conflict resolution, etc. I agree with you about Mrs. Dalloway, but I’m currently reading The Voyage Out and, after a slow opening section (in which Mrs. D. appears briefly), loving it. I do love Berkeley! Nothing more fun than browsing in a university bookstore. Hmm. Nothing has changed too much. 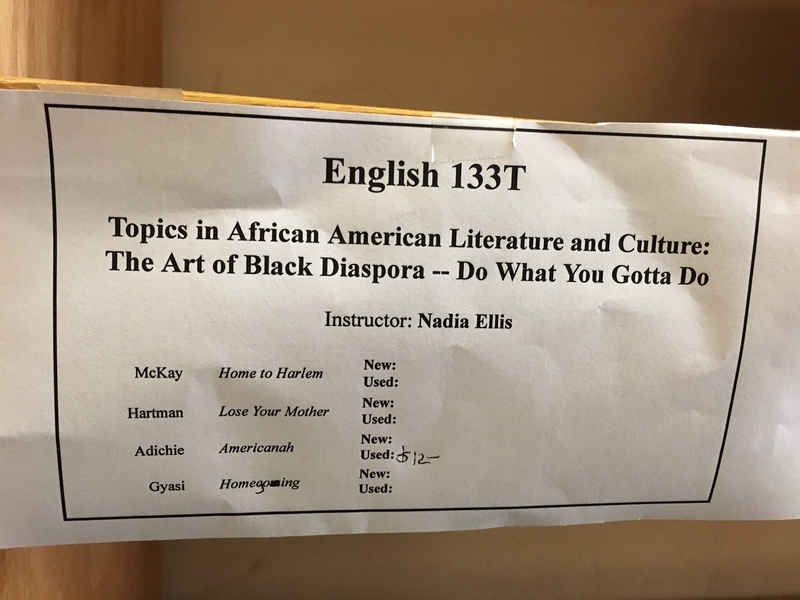 :) I’d adore taking some of these classes. OFF TOPIC—so pleased you are not a fan of VON ARNIM.Saw one of your reviews on GOOD READS today.I thought i was the only person in the world who was not a fan. I loved The Enchanted April so much that I thought I would like the rest of her stuff, but with each new read of her other novels I find her more and more boring. Your review of one of her books really lifted me yesterday as i loathed INTRO TO SALLY.I have given away my last 2 Von Arnim’s and feel light as air.How bad was EXPIATION?